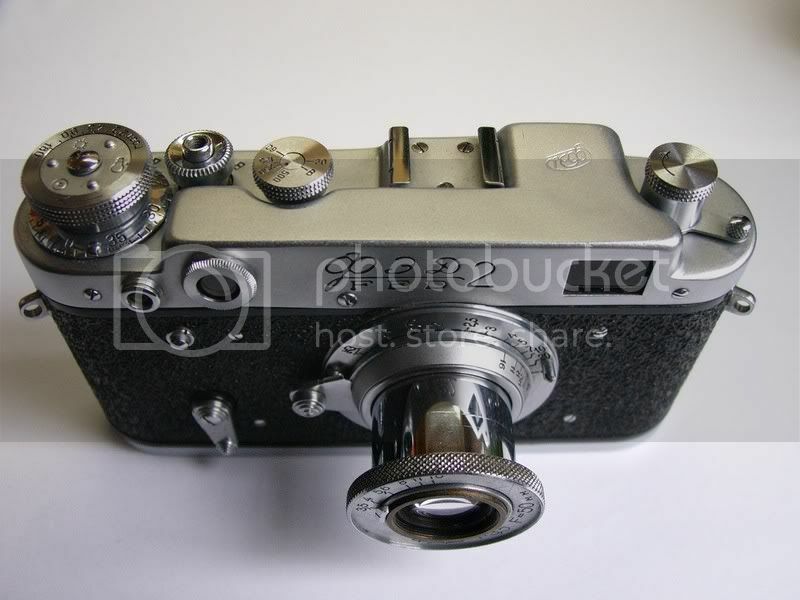 FSU Former Soviet Union RF This forum is for the Former Soviet Union rangefinder cameras, especially the many and various Fed, Zorki, and Kiev. Isn't there a 12 step for this? Step 3) Ask who is better Fedka or Oleg? Step 6) Is this NKVD real? Step 7) Any one have an extra take up spool? Step 10) Sanding or reverse electrolysis? Step 11) Dang it! I forgot my postman's birthday--how do I make it up to him? Step 12) One of each, please. Step 13) I Now Can Only Express Myself In The True Proletariat Manner. I Scorn The Western Capitalist Camera Combine That Seeks To Undermine The Excellent Favored People's Photographic Reality! Last edited by rbiemer : 02-18-2007 at 12:39. Rob! do you have something you want to tell us?????? I hope you mean P l i o bond, or is this like pillowbond, and has it any connection to the present for the postman????? Trying to be funny with out enough coffee in me! OK edited Step 9)I need some Pliobond. Ah I see!! its the Yak hair thing again! I think I'll have to start collecting it, my sister could knit me a toupe with it! robo.rbiemer ~ LOLOL!! Great! And hey, Pilobond, I read right through it and didn't even catch it. USPS is off tomorrow - gives you a day to plan - gotta keep the postal guys happy! I know I'll probably have to dodge a hail of bullets for this one, but here's my latest acquisiton. Wow, that's a pretty amazing looking rig! If your going to put a lot of films through the Fed 4, buy a supply of finger bandages. It must have one of the nastiest rewind knobs ever, used to remove loads of skin from my thumb!!! Well the blame for the Zenith can be laid squarely at Mr Jay Javier's door - he has one on his site and I saw it and just knew I'd have to have one! Yes, it's one sweet camera, sort of honorary RF I think. To be honest I'm not keen on the looks of the 4 or 5, but I needed them to complete the collection of major FED models. Having said that, they are growing on me and the 4 seems to be a very good "user", plus they were both very cheap. 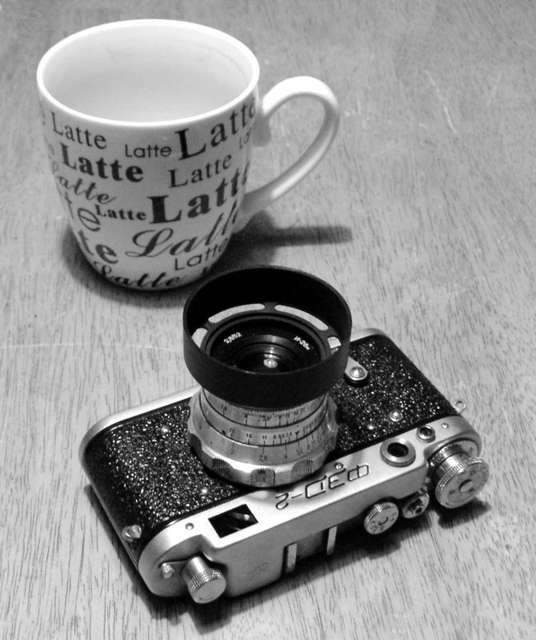 Hey comp_wiz, you didn't happen to take some digi photos of the Z3 CLA did ya? I really need to break into mine and I am stuck at getting the slow speed dial off. One of mine, unfortunately the rear element of that lens is scratched, like someone took to a little patch (right in the centre) with some 1200 wet and dry. To tell the truth I'm not sure if I still have them, but I'll try to remember to have a look see when I get home for it. If I remember properly, I had a lot of trouble with that too, until I realized that the dial itself didn't need to come off. The little "knob" part can be removed, but that is only for adjusting the mechanism. Zorki-6 with rigid Industar-50. My favourite lens for daylight shooting. It only needs a hood. Would 37mm fit? I had to use a cellphone for the pics, since digital camera is out of juice. Last edited by John Robertson : 02-24-2007 at 15:52. Thanks! Ill try to find something in that size. Leitz A36 filters will fit, or copies of them!. Trying to find 33 screw will be next to impossible, I had great difficulties 30 years ago, will be a lot worse now. Your best bet would be these people. They are good to deal with. you can order on line. On quick observation I noticed that the filter ring on the silver I50 seems a little smaller than on the black I 50.
i am new to here!! very nice fed2. and here are my other cameras. ...and i finally got some batteries for the digital camera today. 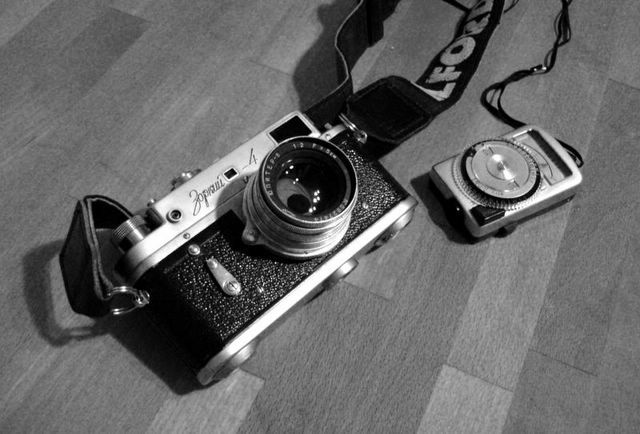 It makes me feel good that my Zorki doesnt need batteries. Ah, a whole thread of nothing but lovely shiney metal masterpieces cortesy of communism! You can see some photos taken with them at http://www.storm.ca/~vladhed/cameras or just go to my gallery! kimisaboy ~ Welcome to RFF. Nice looking FED there. When time permits, feel free to upload some of your photos to the RFF Gallery! nzeeman ~ Howzabout some thoughts on your Zorki.10 there. Good shooter or no? Pros/cons? Don't hear them mentioned much here at the FSU corral. Great thread... Lotsa beauties still arriving! Last edited by bob cole : 02-26-2007 at 13:46. Mr. CVBLZ4, thank you mery much! I will upload more photo to here! I love RF. very much ..
other than Fed 2, I also like to use the Japanese RF. 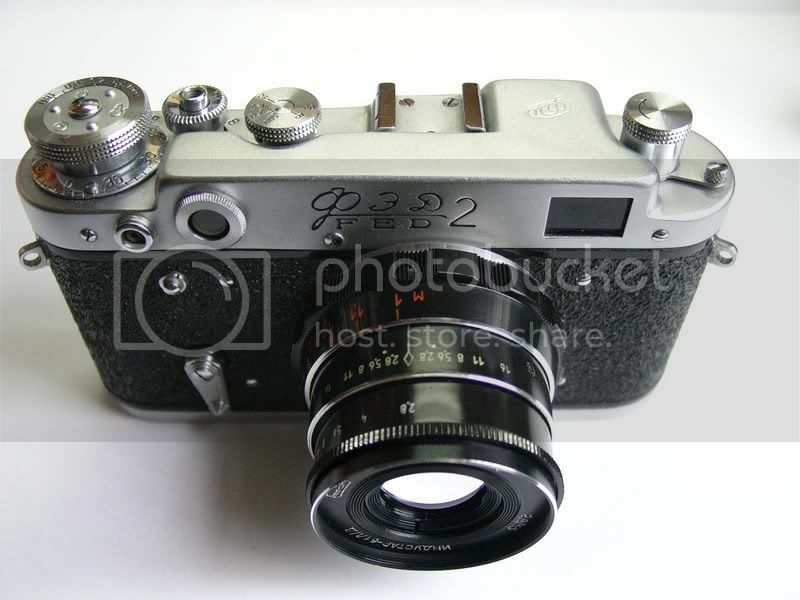 but i love the Fed 2 most! 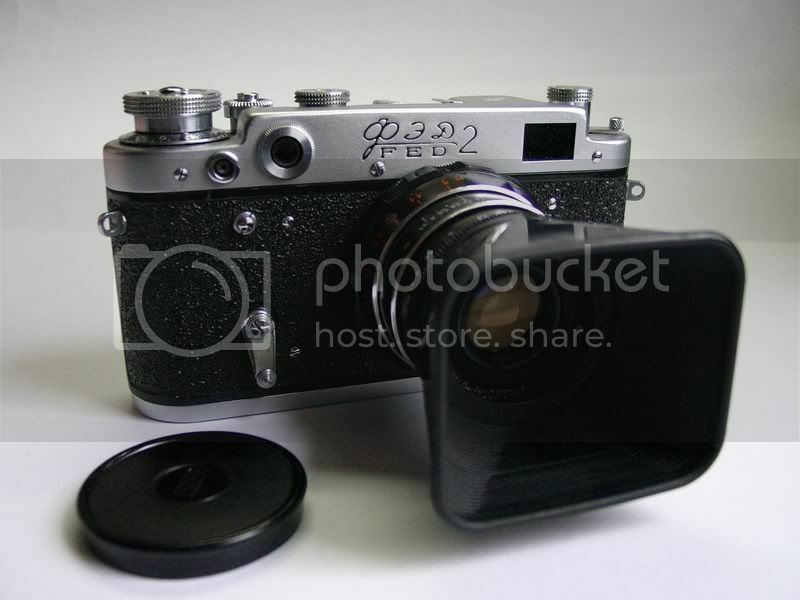 A Fed 5 is shipping to me, too ! 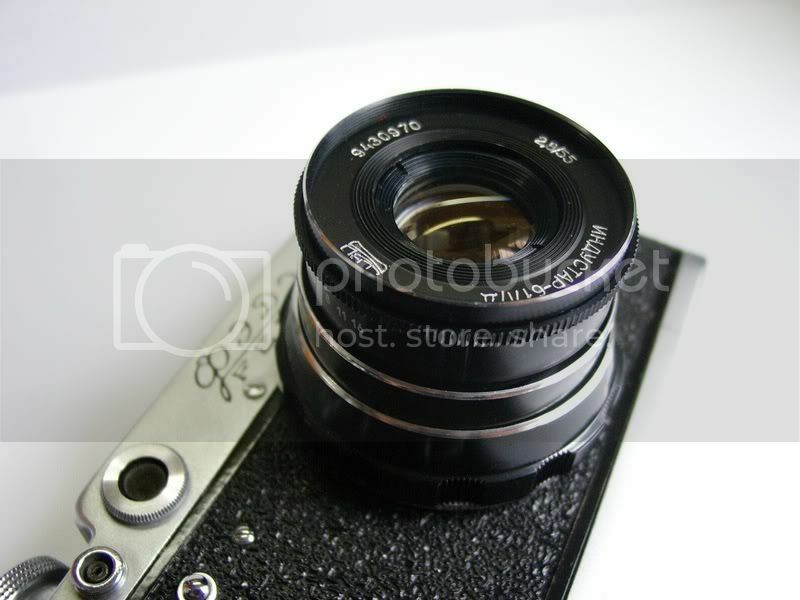 I assume the black one is an SLR lens, then its a late 50-2. Filter size is 35.5mm x 0.5 screw in or 37mm slip on. Its the so called "flat face" version. Okay, John.R, now I'm seriously jealous. The black Russar is on my OOTD list. Envious I hope, not jealous!! Very good lens, usually an almost permanent fixture on the Zarya. Its not a r/f coupled lens so this is ideal. 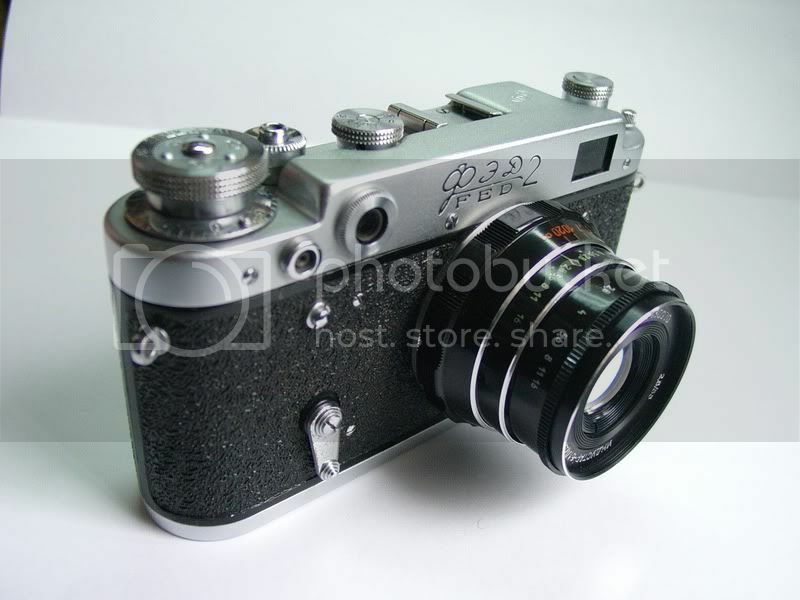 Sadly it wont fit my Bessas, nor strangely the Fed 2,it fouls the r/f arm. works fine on the Zorkis, I suppose after all its a KMZ lens, also OK on the Droog. Very handy it takes a 49mm filter. The finder has a neat parallax correction device. i got it a week ago as a present from my friend. i shot a roll with it but didnt have money to scan and didnt have time to enlarge. i also have 5 other films waiting for enlargement and scan. i hope ill do it this week and then ill send samples. but negatives look nice to me - great exposure - every shot was good. 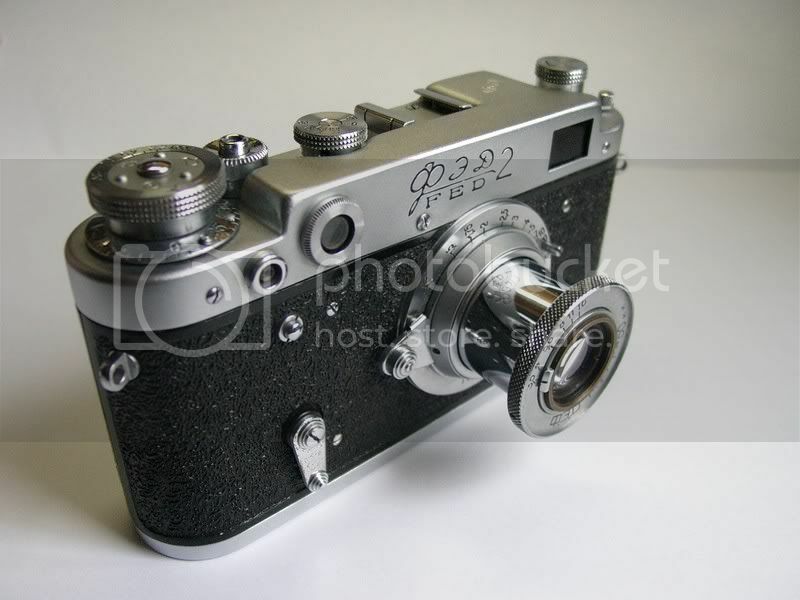 i was expecting a lot of mistakes it has a nice viewfinder/rangefinder- bright and accurate. really a fun camera, maybe a little too big. my only complain is shutter button which have so long travel you have to press it almost 90 degrees to shoot. 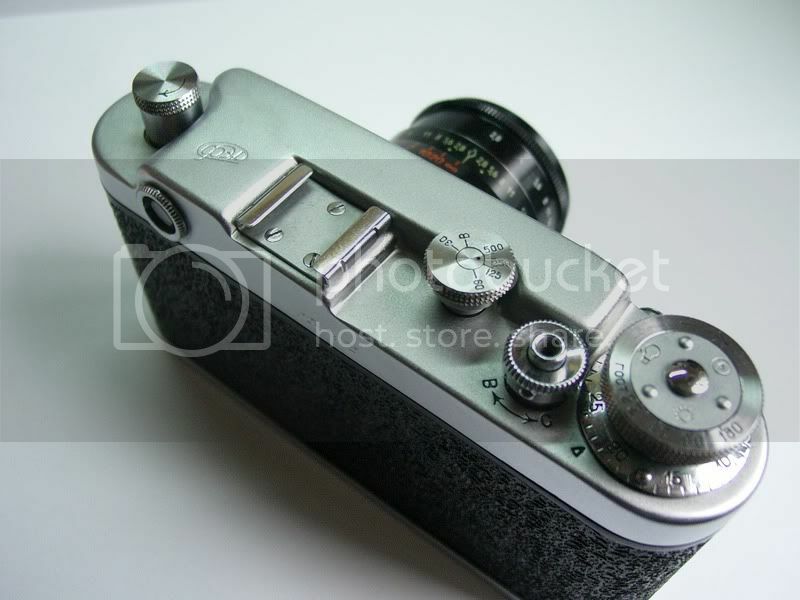 Nope, the black one is a rangefinder lens (seen on my Z6 somewhere in this thread). I guess they changed the size when the black SLR lens came out, so people could use the same filters/hoods on both. Last edited by manfromh : 02-27-2007 at 06:22. Interesting. 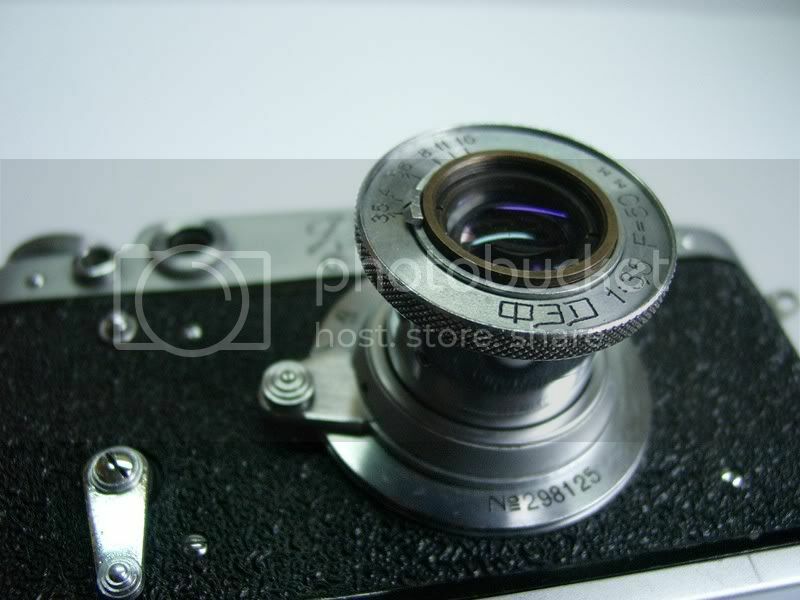 the KMZ site only lists this version as a SLR lens in 42mm thread. maybe a little too big. my only complain is shutter button which have so long travel you have to press it almost 90 degrees to shoot. Same here, and why did they put a B setting with no place to plug in a cable release???? I hate that!! My digicrap is like that!! All times are GMT -8. The time now is 22:18.